Earlier this year in March, the Chinese handset maker Xiaomi launched its most affordable smartphone in India called the Redmi 4A (review). Recently, the successor to the handset turned up on TENAA to reveal most of its specifications to the world. Now, in yet another leak, we get a look at the upcoming smartphone through an official poster where the rear panel of the handset is visible and some key specifications are listed. Looking at the leaked poster, it is clear that the device follows the same aesthetics as its predecessor. However, it is believed to be flaunting an all metal unibody design unlike the polycarbonate build on the Redmi 4A. The device seems familiar with two antenna lines, primary camera and LED flash on top left, and a speaker grille at the bottom. 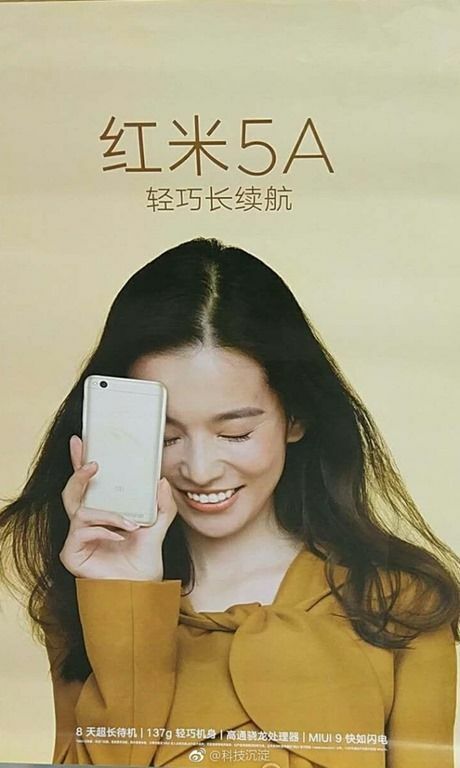 According to the text on the poster, the VFM smartphone will come flaunting a battery that will offer eight days of standby time. Another confirmation from the poster comes in the form of a Snapdragon SoC and MIUI 9 based on Android Nougat. To recap, the TENAA listing revealed that the handset will be featuring a 5-inch HD TFT display, and powered by a 1.4GHz Qualcomm Snapdragon 425 processor, mated to 2GB of RAM. It will come with 32GB onboard storage, which can be further expanded using a microSD card. In the optics department, it gets a 13-megapixel primary shooter with an LED flash and a 5-megapixel front shooter. Coming to the security, there is no fingerprint scanner on the rear panel of the handset and it’s unlikely there will be one on the front panel either. As of now, there is no word regarding the pricing and the availability of the device. However, we can expect the device to be priced in the same range as the Redmi 4A.We will bring you more updates as and when the brand confirms the handset.